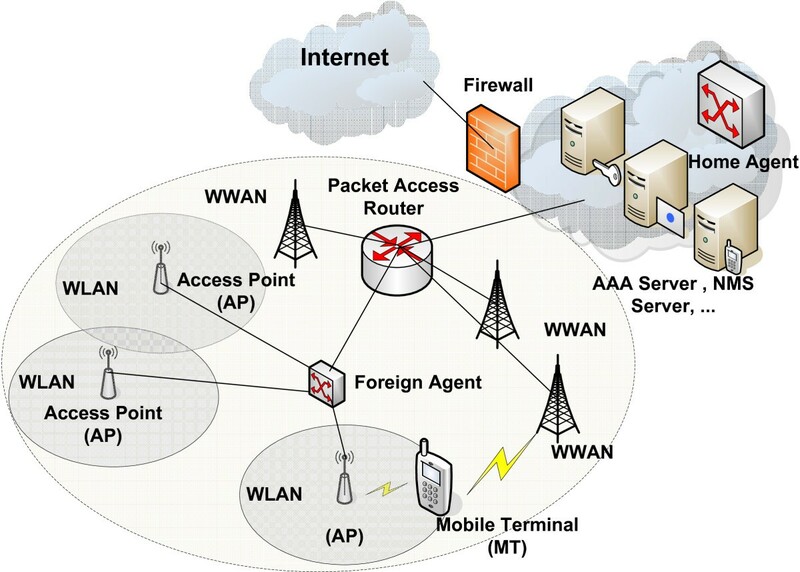 In this paper, an adaptive resource management scheme for hybrid WWAN/WLAN is proposed. Based on proposed joint velocity and average received power (ARP) estimation algorithms, a novel vertical handoff (VHO) for efficient load balancing in multitier network is developed. Simulation results show that proposed scheme achieves significant improvements over conventional schemes. Future wireless communication systems can be visualized as the integration of different radio access network (RAN) technologies, to provide always best connected. Heterogeneous wireless networks (HWN) will give the service provider, a chance to provide sufficient capacity, needed to support the temporally and spatially fluctuating traffic demands generated by mobile users. A practical benefit is that users can be served at lower cost and with the better quality of service (QoS). To support freedom of movement between HWNs and seamless roaming, several VHO management architectures and decision-making algorithms have already been proposed . These will allow full exploitation of flexible HWN infrastructure, resources, and services. Although individual radio resource management (RRM) schemes can be tuned to optimally perform within their respective RANs, they may not efficiently perform in an HWN if the different RRM schemes are not properly managed. Hence, a major issue is how to jointly utilize the resources of the different RANs in an efficient manner while simultaneously achieving the desired QoS and minimizing the service cost from both user and service provider perspectives. In an integrated heterogeneous wireless network (IHWN), a mobile terminal (MT) is equipped with heterogeneous network interface, which is called the multimode terminal. When a multimode MT generates or originates a new call in an IHWN, it can select connections among different types of the IHWN based on network selection strategies. An active multimode MT can also change its connections among different types of IHWN. Such a process is called the vertical handoff (VHO). Traditional handoff algorithms are based on link quality or estimate of ARP. However, this measure is not sufficient for VHO, and other factors like mobile user velocity, network condition, and user preferences should be considered. Also because of complex structure of next-generation networks, more precise and sophisticated method for link measurements is required. In mul-tipath channel, received signal strength (RSS) is consisted of three different phenomena (path loss, shadow fading, and fast fading). Because of MT mobility, multipath effect, and shadowing, the RSS has fluctuations, which make raw signal strength an unstable criterion for triggering vertical and horizontal handoffs (HHOs). Shadowing, large-scale variation in path loss, is caused by obstacles in the propagation path between the MT and the base station (BS). 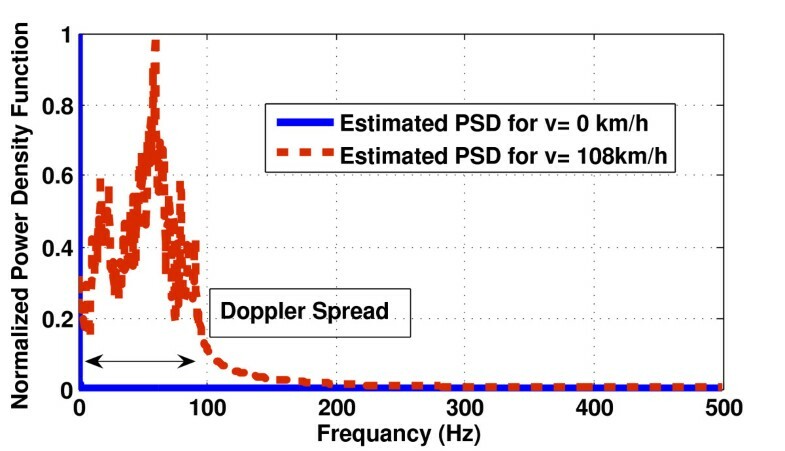 The small-scale variation is due to the Doppler shift along the different signal paths and the time dispersion caused by the multipath propagation delays. As one primary indicator of channel quality, the power of the slowly varying shadow component is important for handoff decisions and power control. Most existing handoff algorithms assume that multipath fluctuations can be adequately filtered and base their handoff decisions on local mean power estimates [2, 3]. Although these variations bring back uncertainty in the act of VHO decision making, they can be utilized to extract precious information about propagation environment and mobility behavior of mobile user . In order to mitigate these variations in RSS, efficient smoothing techniques must be considered. If the averaging interval is too short, fluctuations may not be effectively removed, or if the interval is too long, it may cause delay in handoff procedure, or in non-line of site (NLOS) scenarios, it can average out useful information of corner's positions. To fully exploit the capacity of the wireless channel, and to overcome ping-pong effect, an efficient power estimation method is required [5, 6]. The ping-pong effect occurs if factors for VHO decision are changing rapidly and an MT performs the handoff as soon as it detects a more suitable BS. Because of heterogeneity, PHY and MAC layer of different IHWN are different, so a unified approach must be taken into consideration for collection of specific measures from different networks. As a result, more sophisticated VHO algorithm is required to extend the throughput of multilayer network and to increase efficiency of resource management for next generation of HWNs. In this paper, utilizing an accurate joint velocity and ARP estimation algorithms, a novel VHO algorithm is proposed which can effectively be used for load balancing and internetwork ping-pong effect reduction in HWNs. Also based on Markov model, an analytical model for performance evaluation of the VHO algorithm is proposed. This paper is organized as follows. Section 2 reviews related work on VHO algorithms. In Section 3, propagation model for an IHWN is introduced. In Section 4, proposed load balancing algorithm is discussed. VHO algorithm analysis framework is described in Section 5. The performance of the proposed VHO algorithm is analyzed through a theoretical model and simulations based on probability of blocking and probability of false network layer assignment in Section 6. Finally, paper is concluded in Section 7. Early works on VHO considered multitier homogeneous networks and used the RSS as the main factor of the hand-off decision-making process . However, the VHO needs to be triggered considering a few more factors . In , a VHO algorithm is proposed based on a assumption that a data call is kept in the higher bandwidth network as long as possible and voice calls are vertically handed over as soon as possible to avoid handoff delay. In , a network selection strategy that only considers mobile users' power consumption is introduced. To maximize the battery life, the mobile user selects the uplink or downlink that has the lowest power consumption from all of the available networks. In , a policy-enabled network selection strategy is proposed, which combines several factors such as bandwidth provision, price, and power consumption. By setting different weights over different factors based on the user's preference, a mobile user can connect to the most desired network. Reference  presents a signaling protocol for the exchange of information between a network management system and intelligent multimodal wireless terminals in a heterogeneous environment; some preliminary measurement works were done mainly between WLANs, general packet radio service (GPRS), and digital video broadcasting for terrestrials (DVB-T), but the described algorithms were very simple, and it did not present how such redistribution would be performed in detailed steps. Efforts on standardization of the VHO operation can be review on [13–15]. Although the above network selection strategies have their own advantages, they did not put much attention on system performance, such as the blocking probability of originating calls and the forced termination probabilities of horizontal and VHO calls. They fail to address any ARP and also velocity estimation method in order to perform an accurate and seamless VHO. Also these have not considered corner effect and effect of low SNR in cell boundaries. In a homogenous environment, the ping-pong effect is a phenomenon that rapidly repeats HHOs between two BSs and can be mitigated by means of dwell timer (DT) or hysteresis margin . In a heterogeneous environment, the ping-pong effect occurs if factors for the VHO decision are changing rapidly and an MT performs handoff as soon as the MT detects the better BS . The DT scheme has been used to avoid such ping-pong effects due to the fact that RSS from HWNs is not comparable to each other [5, 6]. The ping-pong effect can also occur if the MT's speed is high or its moving direction is irregular. 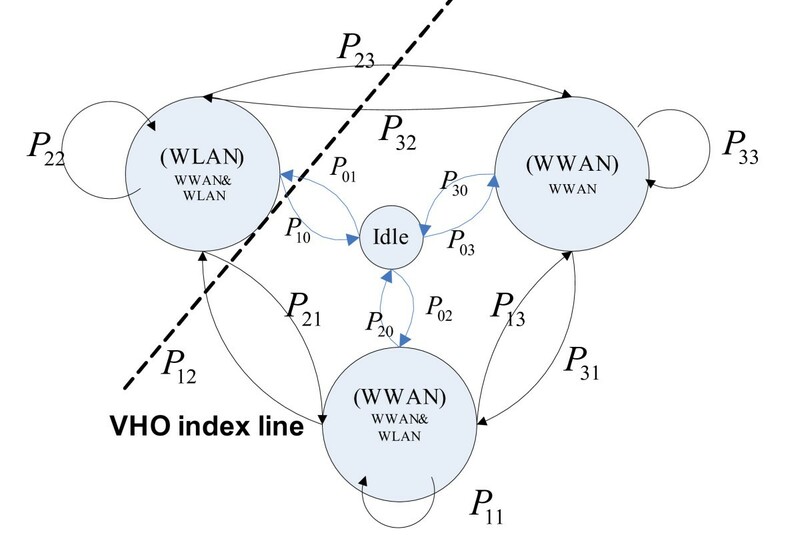 Therefore, the proposed VHO algorithm balances the traffic load in each network based on efficient mitigation of inter-network ping-pong effect and also based on MT mobility behavior. To suppress noise and interference terms, γ[n] is passed through a unit-gain, square-root raised cosine lowpass filter with a bandwidth BW > fmax, since we are only interested in the Doppler power spectrum, which is narrowband and variable (0 - fmax(Hz)) in microcellular structure. fmax is maximum possible Doppler frequency of channel. An example of RSS in a microcellular environment is plotted in Figure 1, for variable mobile speed when long-term SNR is 20 dB. As it is seen, short-term SNR is high near base stations. Long-term SNR is plotted for 100 s observation. 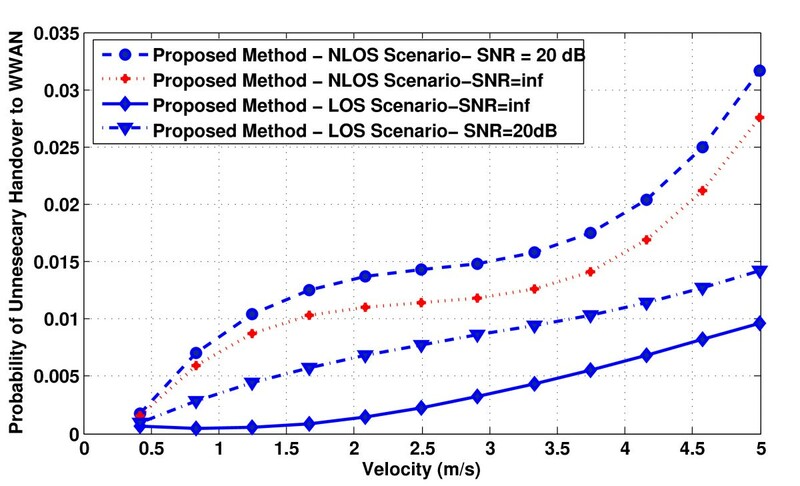 Simulated RSS for variable mobile speed, long-term SNR = 20 dB for noisy RSS. Knowledge of MT's position and velocity plays an important role on offering efficient network controlling mechanisms and variety of offered services in IHWNs. Mainly in IHWNs structure, WLANs have less coverage than WWAN, so a reliable mobility tracking algorithm is desirable to reduce the number of handoffs and waste of bandwidth due to unnecessary signaling. Researches about MT speed estimation are divided into two different groups. 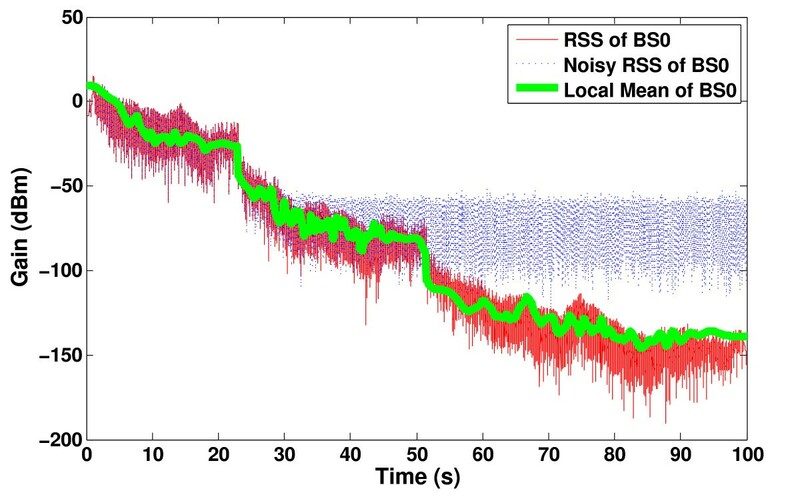 First one uses statistics of RSS from different BSs measured at an MT and second one uses corresponding propagation times called cell sojourn time (CST) in order to show if user speed is slow, medium, or fast. Both categories are subjected to strong irregular variations caused by Rayleigh fading and shadowing [17, 20]. Many of fading distribution property (FDP)-based methods give an accurate estimate in noiseless environments, but in noisy environment, results are unreliable [17, 20]. In urban area which is modeled as Manhattan structured microcell, speed estimation is more complicated, due to complexity introduced by severe fading and noise. On the other side, although the CST-based methods work well in noisy area , but these algorithms lose their accuracy when they are used on highly dense urban area with variety of building structures. Because CST-based methods calculate MT speed by comparing the CST with a predefined time threshold, a manoeuvering user with variable speed might have more (less) actual speed than what is estimated based on comparing CST with predefined threshold. High MT mobility in cell borders is another issue which can result in many cell border crossings. The sojourn timer resets every time MT crosses the cell border, thus a slow-moving MT that is repeatedly crosses cell border is considered as a fast-moving MT by CST-based schemes . In addition, CST-based algorithms fail to estimate variable speed. When variable speed MT is circulating around the cell boundary, CST-based algorithms classify MT as a slow-moving MT. CST-based speed estimation algorithms require estimation and calculation of statistical properties of CST in coverage area . In order to calculate probability and cumulative distribution functions (PDF and CDF) of CST, while taking into account presence of fast fading, shadowing, corner effects, and uncertainty region between neighboring BSs, it is required to perform simplifications and assumptions, which results in lack of generality. Hence, an FDP-based method for MT speed estimation is proposed in this paper. A simple type of window-based ARP estimators, namely weighted sample average estimators of local mean power, is currently deployed in many commercial communication systems, and various other window-based estimators (WBEs) have been proposed in . These WBEs work well under the assumption that the shadowing is constant over the duration of the averaging window, and in this case, their performance improves as the window size increases. 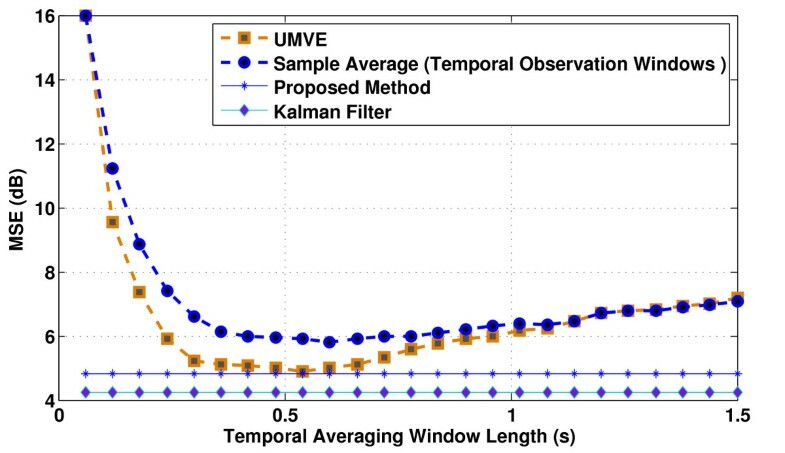 In practice, however, the shadow process varies with time (albeit slowly relative to the fast-fading process), and this variation must be considered since both analysis (developed herein) and experiment show that the mean square error (MSE) performance of these WBEs deteriorates severely when the window size increases beyond a certain value. For variable speed, the observation window must be adapted constantly, and the rate of adaptation depends not only on the MT speed but also on the sampling period and shadow fading characteristics. In particular, errors in the estimates could propagate due to suboptimal observation windows. 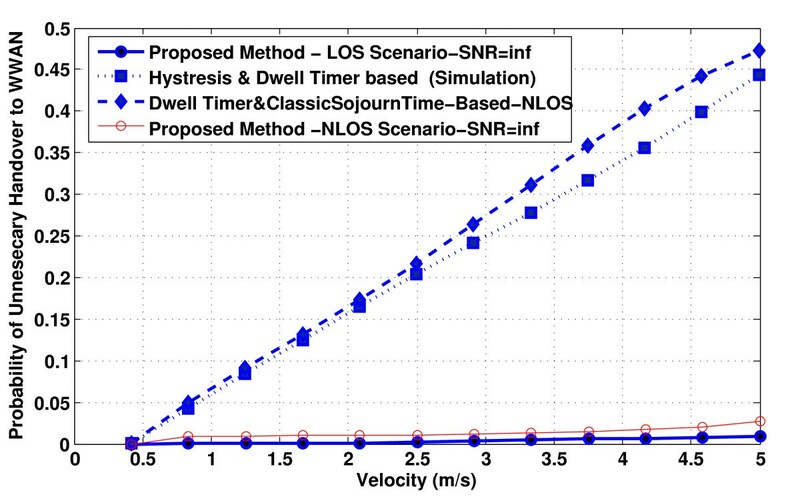 A joint velocity and power estimator are proposed in this paper to calculate mobility behavior of ma-noeuvering MT in dense urban area also to mitigate fluctuations of RSS in order to minimize number of VHOs and simultaneously assign different service requests and MTs efficiently to different networks in a IHWN. This in turn can minimize probability of blocking and probability of false network assignment. where ω K = 2 π K N for K = 0, 1,..., N - 1. It is well known that fast-moving MTs cause high Doppler spread while slow-moving MTs cause low Doppler spread. Therefore, the shift in local maxima of estimated periodogram (PSD) is related to maximum Doppler frequency, which is proportional to the mobile speed ( ν ^ ∝ f ^ d . λ ) in which υ ^ i is estimated speed under i th window and λ is wavelength . where ŝ i is the estimated ARP, L i is window length, Δt is sampling interval, and F is normalization factor . Active smoothing window is switched to another window in which duration is selected proportional to inverse of estimated velocity for any iteration. The schematic of joint ARP and velocity estimator is shown in Figure 3. 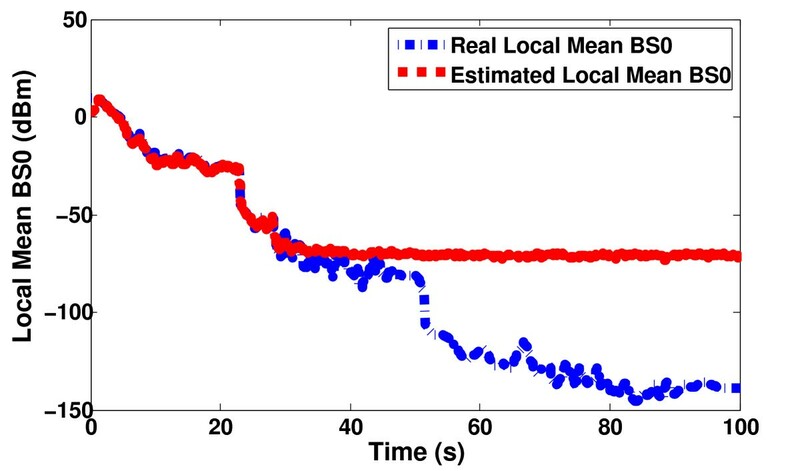 Bias and variance of proposed local mean estimator power are given in Appendix A. Folded PSD which shows Doppler spread for different velocities. As it is mentioned in previous section, due to heterogeneity of integrated networks, measurements of each network cannot be compared directly to other networks, so hysteresis method [10, 11] cannot be utilized in VHO algorithm. Thus, thresholding technique is considered in this paper. In HWN structure shown in Figure 4, each network shall have its own thresholds. Also due to the fact that requirements of load balancing in each network are different, so proposed algorithm is divided into 2 sections, (1) Downward VHO from WWAN to WLAN and (2) Upward VHO from WLAN to WWAN. In defined scenario, HHOs are only between BSs of WWAN network due to limitations of coverage that WLAN access points have. HHO algorithm utilizes joint velocity and ARP estimator in the act of HHO decision making. Proposed HHO is based on using hysteresis margin method  in addition to DT which is calculated based on inverse of velocity estimates. Block diagram of proposed VHO algorithm is shown in Figure 5. First, velocity and RS local mean are estimated from raw RSS. Values and thresholds used in the VHO decision making are also calculated and updated periodically. The proposed load balancing algorithm selects a network based on specifications of each network. Algorithm 1 illustrates VHO algorithm. 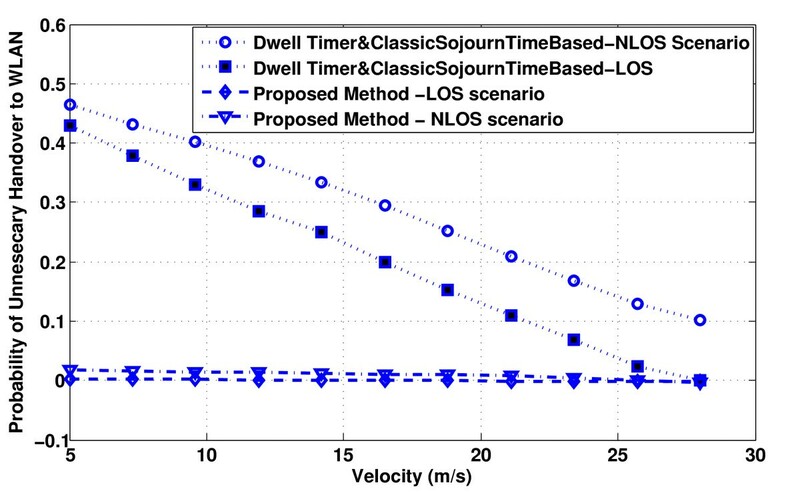 According to Algorithm 1 in order to reduce the effect of velocity estimation error on accuracy of VHO decision making, average of the all the velocity estimates during dwell time period is considered as a velocity estimate to classify MT as pedestrian or fast. The idea of utilizing 2 thresholds for adding MT to the list of upward VHO candidates solves the problem of lack of accuracy in scenarios that slow manoeuvering MT are bouncing inside and outside of cell boundary. Benefits gained from knowledge of user real velocity are to reduce ping-pong effect caused by mobility behavior of MTs, and idea of using adaptive DT ( ( t DT ∝ 1 / υ ^ ) ) velocity lack of ability to use hysteresis methods for HWNs and in addition to novel proposed ARP method mitigates ping-pong effect caused by fluctuations and RSS due to fading. Block diagram of joint velocity and RS local mean unit. Block diagram of VHO decision making unit. State0) The user has no active session in progress and is not occupying any channel (i.e., the user is idle), independent of its location. State1) The user in the WLAN coverage area is occupying the WWAN resource. State2) The user in the WLAN coverage area is occupying the WLAN resource. State3) The user in the out of WLAN coverage area is occupying the WWAN resource. Based on Algorithm 1, a user can change state from state0 to any nonzero state when a new connection is made. If a session is completed while a user is currently in a nonzero state, the user changes to state0. The Markov chain depicted in Figure 5 is irreducible and aperiodic, and all the states are recurrent nonnull, so that the equilibrium state probabilities can be determined by solving the (9), subject to the normalization condition ∑ i = 0 N state P s i = 1 ; however, the expressions for the transition probabilities remain to be determined; these form the topic of discussion in the succeeding sections. The service model relies on four assumptions. Due to wide coverage that WWAN has, we assume that probability of MT being inside the coverage area of WWAN, PWWAN = 1 and as the coverage area of WLAN is subset of WWAN; it is clear that PWLAN < 1. Call duration Tcall is exponentially distributed with a mean of 1/μ, where μ is the average call completion rate. Hence, the call completion (termination) probability Pterm = P (Tcall ≤ Tth), where Tth is the time unit for the user state transition diagram, as shown in Figure 5. From ∑ i = 0 N state P s i = 1 , it is clear that for scenario depicted in Figure 5. P WWAN = ∑ i = 0 N state P s i and PWLAN = Ps0 + Ps1 + Ps2 = 1 - Ps3. State transition diagram for N network = 2. Other transition probabilities can be determined likewise. To calculate a close form for transition probabilities, it is required to calculate joint and conditional PDF of RSS which is given in Appendix B. Local mean power estimation results. MSE of local mean estimation versus averaging window length, v = 20 km h -1 , X c = 10 m, shadowing variance σ s 2 = 6 dB , LOS scenario. where PeWW is the probability that slow user is allocated to WWAN, which gives arise to shortage in macrocell capacity, and PeWL is probability that the fast user is allocated to WLAN, which causes increase in number of hand-offs. Speed threshold is considered Vth = 5 m/s. As it is demonstrated in Figure 9 and 10, in both LOS and NLOS scenarios, due to efficient load balancing based on mobility behavior of MTs and network conditions, probability of false VHO to WWAN and WLAN (i.e., two consecutive VHOs within a short duration for a roaming call in the hot-spot area or a very short WLAN session before the user moves out of the hot-spot area) is efficiently reduced. Effect of low SNR on proposed method is plotted in Figure 11 and 12 for upward and downward VHO, respectively. Because of robustness of proposed method even in low SNR scenarios, load balancing is done effectively. 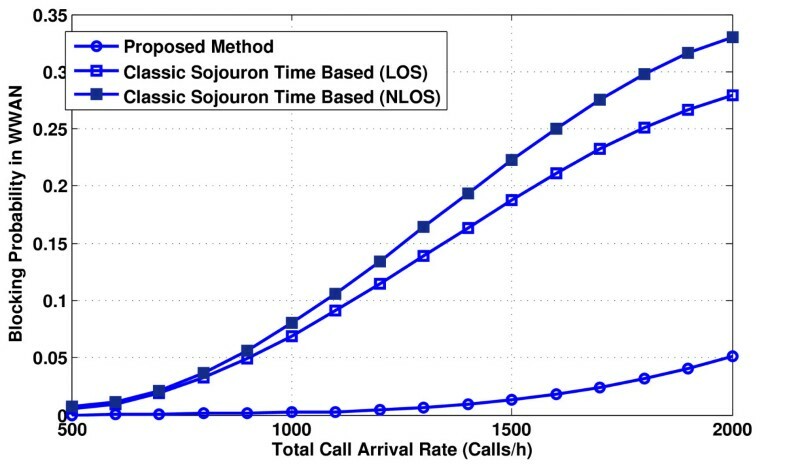 In Figure 13 and 14, blocking probability is plotted versus different call arrival rate (from 500 calls/h to 2,000 calls/h) for each layer with λ n = 0.4 and 1/λ = 120s. Figure 13 shows that blocking probability is effectively decreased in WWANs due to more efficient load balancing, and as a result, blocking probability is increased in WLAN (Figure 14), which shows more WLAN resource utilization due to more efficient load balancing. For better demonstration, blocking probability in WLAN and WWAN is plotted in Figure 15 and 16 versus specific arrival traffic with variable ratio of slow traffic, respectively. As it is shown in Figure 15, when number of slow MTs is increased, blocking probability is decreased in WWAN and as a result for WLAN as it is plotted in Figure 16, there is a small increase in blocking probability. Probability of false downward VHO. Probability of false upward VHO. Probability of false upward VHO, SNR = 20 dB. Probability of false downward VHO, SNR = 20 dB. 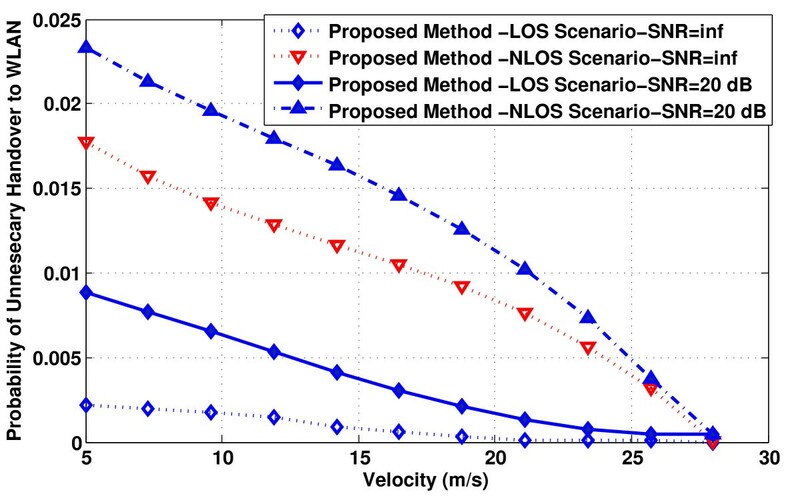 Blockage probability in WWAN, LOS and, NLOS scenarios. Blockage probability in WLAN, LOS and NLOS scenarios. 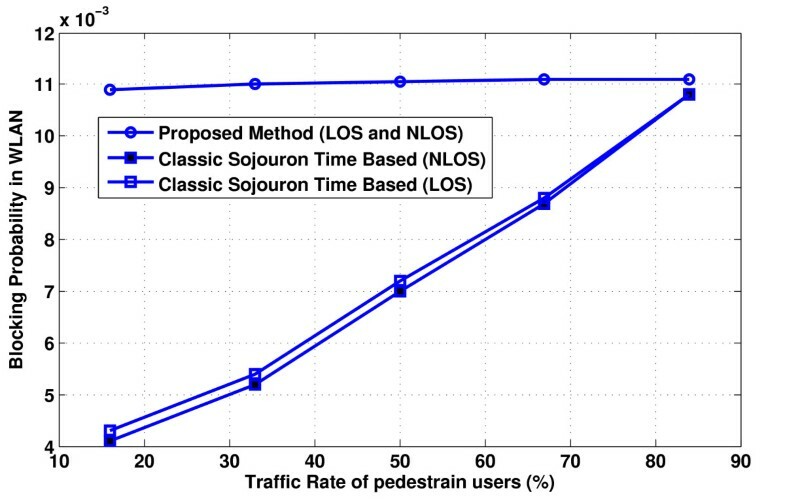 Blockage probability in WWAN for different number of pedestrian users in LOS and NLOS scenarios. 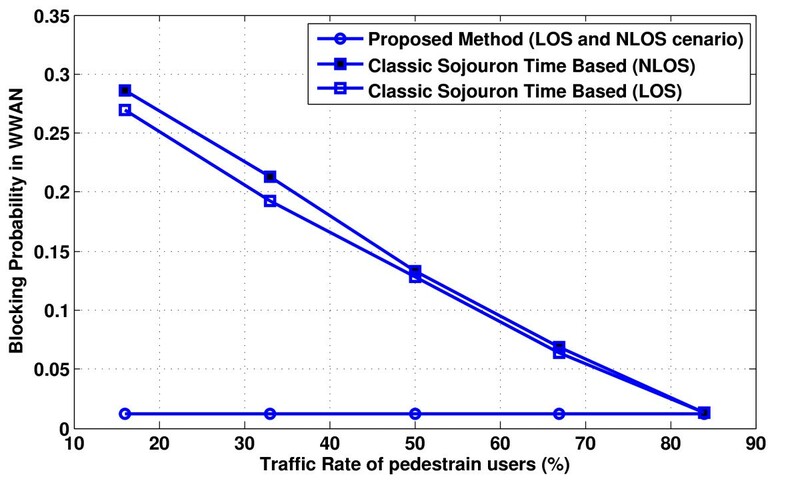 Blockage probability in WLAN for different number of pedestrian users in LOS and NLOS scenarios. 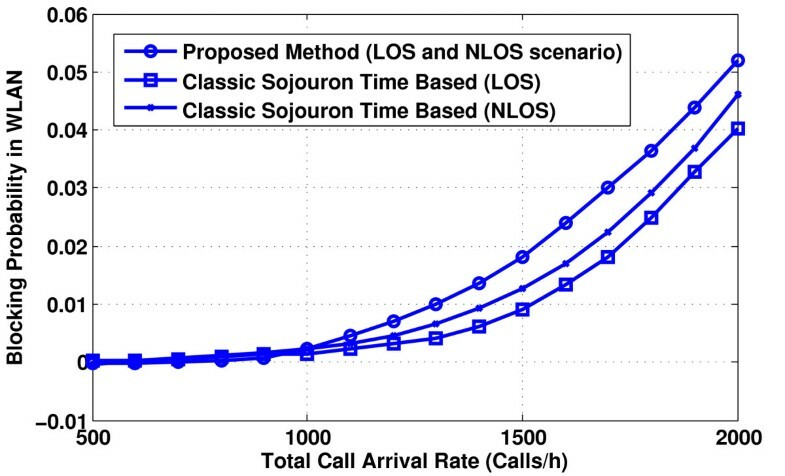 This paper proposed a load balancing scheme that minimizes the VHO rate while achieving the desired service quality (i.e., low call blocking probabilities) for highly dense urban area. The performance of the proposed scheme was analyzed via user level Markov chains. Numerical results show that the proposed scheme achieves low VHO rate and low call blocking probability in comparison with the currently existing service-based and sojourn time-based load balancing schemes. Results show that, under different mobility conditions, the proposed scheme exhibits more recourse utilization in integrated networks while achieving low blocking probability in highly dense urban area. Based on these results, it is concluded that the proposed scheme exhibits a good service quality and, hence, serves as a viable alternative for practical IHWN deployment. After substitution in (25), bias can be calculated as follows.